It is 11.27pm my time on 31 Dec 2014. Nostalgia Or Living In The Past? There’s something about New Year’s eve. It makes me nostalgic to reflect on the past. This is where my trouble begins. I see my past and wonder if I have achieved, under achieved or over achieved. I don’t see that I have over achieved. Most sane logical thinking humans would agree as each sets new limits. As if doing the Limbo Rock, we tend to lower the pole as we want to do better! Up the ante it is called. Too much means being greedy, as one not knowing limits and pushing self off the cliff to the deep end, somewhat. Aah but it is also said that with no ambition and aspirations, one is an under achiever. So, it seems we need a fine balance or the intelligence to know the difference to brake if chasing too much and to accelerate if not enough! My past has always been a struggle. One rung after another as the ascension up the corporate climb. Work hard was the motto and I soon learnt that those who worked hardest did not get very far when compared to “social butterflies” who flitted around water coolers and flaunt their female bodily assets! Silly me! I had not much of a body asset to flaunt and was not one of those who batted “come hither looks” instead I emitted, “work hard and go thither” look LOL! Living in the past will not help me but reveling in the past helps me to take stock of my past, correct things that I could have or may have done better. Nostalgia or living in the past I am unsure but what I do know is the past helped built my future and the future will be my past in time to come. I call it stock taking and was pleasantly surprised when S Man sent me a thank you note for my friendship and encouragement over the one year of being friends. Sincerity, goodwill, faith and trust is key and I am nostalgic, as it is the end of 2014! A picture paints a 1,000 words…. Man!!! If only life can be that good! Lazing on deck chairs, tanning..nary a worry in the world. Happy New Year 2015! Chill as the cats are doing…. I am one of those that is needing a dentist every 3 to 4 months. Sigh! Not because I chomp on sweets and all things sugary and nice BUT I have an underlying autoimmune disease that causes my gums to go to war every now and then! Aaargh! So my “best” pal is also my trusty dentist, Dr Chua Chee Haow. I could not consult him this quarter as I was told he had surgery! So I had to postpone my dental treatment for this quarter. When I finally saw him today, he showed me his stitched up elbow! Now my turn to poke him a little as he always teases me on my surgery. His brand of sardonic humor! Ya right, I said. Probably an anaconda considering the deep gash! We laughed. He told me literally he was bitten by something and the wound would not heal and thankfully after 5 surgeries with skin graft it healed. He went to the hospital opposite his clinic and was impressed with the speed he was seen and warded within minutes. I told him he was lucky he did not get flesh eating bug. As he did dental treatment for me he reminded me my gums would be raw! “You will feel pain, but then you know you are alive” – profound but true when I heard it. He then continued, ” I am doing roadworks on your gums! Drill, scrape and then tar” LOL! Meanwhile take care Dr Chua. Whilst it was a “joy” to have found the plane, there seems to be no survivors. Still, it gave closure to the bereaved families who lost their loved ones! 3 bodies were found floating and President Widodo is promising his best to evacuate passengers and crew. Comparative to MH370, this ill fated Air Asia QZ8501 search and recovery was better handled by Indonesian authorities, immediately accepting help from neighbors for search and rescue efforts. MH370 was and remains a mystery to date. It “vanished” presumed crashed after deviating off course, undetected! From Sunday to Tuesday, today, two days plus to pin point the crash site as rescue efforts expedited from Singapore, Malaysia, Indonesia, Australia, USA, S Korea and even India beavered to find the crashed plane. Closure will be given to the bereaved family members and I am silently wishing for survivors hopefully. May God and all deities rest the souls of the decedents and grant survivors to be saved immediately! May the bereaved families bury their dead and be resilent to overcome their grief. Singapore lost a two year old girl. May her relatives overcome their grief of the loss of her parents and her as well. Simple question – how to be a friend? If friendships involve loaning monies, I do not call this a friendship. If I have a friend in need, I would prefer to feed the friend and find a way for the friend to fish and continue to have food on the table. Most people end up in need of funds to fuel a gambling habit that takes different forms – slot machines, lottery, investment properties, stocks etc. It all reeks of the word, “Gambling” to me. Friendships via words is also not worthy. Again, let me explain. I had an acquaintance (downgraded from friendship) who sought me out when her father needed a job. Since I was in the position to hire and there was a vacancy at the place where I worked, I managed to help her. This lady then pays great lip service. As I battled illness, she would text me in the wee hours of the morning when she is on night shift to communicate with me. I was silly then. I was the one who was ill and in a hospital but she would not show face to see how I was nor sit with me, but will only text me during her free time at work, when she had nothing else better to do. I took stock for a long time of this person and decided after couple of years, that this lady was not one I can term a friend as she seemed selfish to me. I may be wrong, but I felt she was selfish as she did not care about my needs in hospital to sleep but expected me to text her replies till she finished her shift at 6am. Sigh! So, back to my question again…how to be a friend? When someone I knew, whose parent was at end stage cancer and in need of hospice care, the least I could do was to hook her up to a personal contact such that her parent was best taken care of, with extra tender loving care. I felt happy. I felt rewarded as her parent passed peacefully amongst loved ones. Another I knew sought me out for a huge sum of money. I could not count the zeroes and felt that this person would benefit better earning it. I pointed the person to a potential bid for a job that matched the money he required. I taught this person how to bid for it, helping with the guiding principles. He won it. He forgot me. Still, I felt I have achieved. It is not easy to be a friend. When people who approach me for help and do not get it, they get angered and upset. I lose this friendship usually. Too bad, but it happens. In life, if friendships depend on a need, then it is not real nor sincere friendship I feel. Friendships are best made and kept during school days as these were made as peers and together, we kicked stones to play hop scotch and shared a meal. Even in University days, I made cakes or cooked a meal and had friends over from different countries – it was wholesome and meaningful. The love and friendship that my host parents shared with me are still nearest and dearest to me, though we live 24 hours flight time away in different ends of the earth. It must have been hard for them to open their homes and hearts to a foreign student they had no clue about. I could have been Freddy Krueger with a an axe hidden somewhere?! Still they took me in, welcomed me to their home and the rest is history! Unfortunately, I became a corporate woman that travelled so much that I have lost touch with my friends in school who largely did not progress to university as most felt it was better to marry and stay home, rear kids. Further, I battled illnesses and kept my corporate position, without sliding. Some migrated to Australia, others became flight stewardesses and found pilot husbands. Must friendships have expectations? Hard to say NO as humans tend to have expectations. I prefer not to have expectations of friendships because having expectations of friendships hurt terribly. If I can afford it, I give and give from the heart. If I cannot afford to give, I don’t. If the so called friend then feels upset with me, then, I feel it was not the right friendship to begin with. Friendships are not the easiest to make, retain and treasure in today’s world. Perhaps it is because of better education, the bad image of consters that make us all a tad more careful in opening our hearts, minds and home? Chicago Garfield – A Different Species! A Garfield From Chicago – Very Different From Those I Have! Mr Ability To Earn tends to travel to Chicago Business School for his courses, once a year. During one of his travels to Chicago, he came across this depiction of Garfield. I guess this was fashioned after the animated movie of Garfield with Jennifer Hewitt and it was certainly not the usual look and feel of my range of Garfield collections. Of course Mr Ability To Earn was very happy – most of the people who knew me well, know of my craze and love for this inanimate fur ball creation of Jim Davis. Mr Ability To Earn has no theatrics and cannot hide surprises. We (Chicken, Bird and I) often call him Mr Wood as he is indeed like Block Wood. Expressionless and always wearing a frozen smile on his face. I do appreciate his efforts in eyeing potential Garfields. My first question to him was ” Genuine Garfield or fake?” The look and feel was different. But it said Paws Inc so that was that! 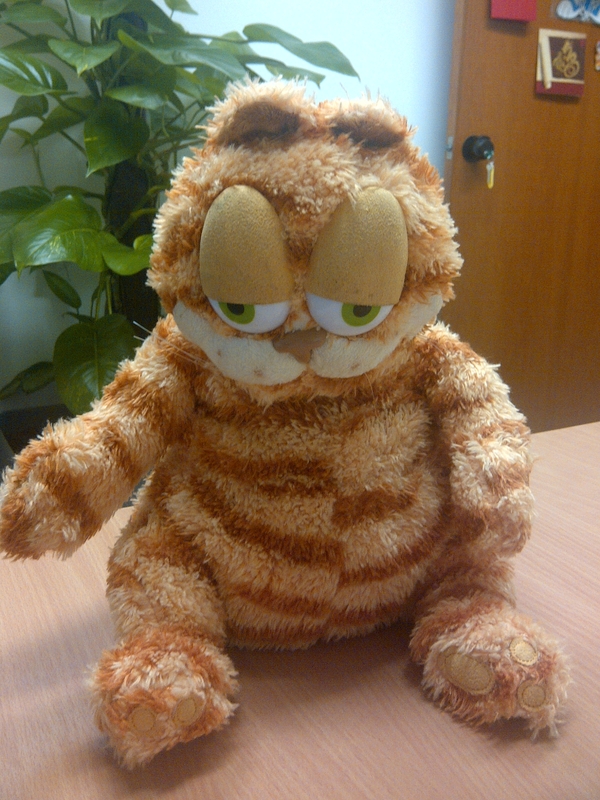 Any how, this Garfield is now nestled amongst his other kind….poor cousins or otherwise, this one is different and like humans, all humans have the same physique but look differently. Still we are called humans, just crafted differently. Aaah, it is the proverbial eve of New Year 2015’s eve! Time flies rather quickly…but for us Asians, we have another New Year coming as we follow the Chinese Lunar Calendar. Ha! Ha! We get to have Chinese New Year in February 2015. 2014 has not been a terrific good year for me and I am glad to have it gone. The faster the better! LOL! Most of the people I know are away. Mr Ability To Earn is away in Hawaii with his family as it seems his wife’s sister at age 60+ found true love at this tender age and is getting married! Both bride and groom are in their 60s and they are getting wedded for the FIRST time! Whoopee just when we thought “love” was quite dead! But then, the skeptical me was thinking….if both have been bachelor and bacherlorette for so long, would it not be hard to live as a couple. I thought about meself! If I am at that age, will I marry? By age 60s I am sure we are all going to be fixed in ways. For eg, how do I share the gogglebox? Well, we both could have each, so, it means two of everything! We could have separate toilets. This way, hygiene is at the level I can pee and go in comfort! How has 2014 treated me? The start of 2014 was mean. It saw me battling to survive a seriously long surgery and getting back on my feet. I slaved as a minion to the likes of Pig Head Without Tail, Scorpion King and Evil Witch and ended 2014 without gainful employment – my commitment to honesty! As 2014 draws to a close, I think over the relationships I have had in the so called category of friendships over the years and found that there is little reality in “friendships” – what does “friendship” mean? I drew up a list of people whom I have helped throughout my life and realised that none of these have kept in touch. I was bantering with Chicken last evening on Whats App and I told her, as my so called “friend”, I hope she does not betray my friendship too. I had to torpedo her I felt as I was quite fed up with the idea of friendships. Friendships in my little red dot meant squat. People befriend for getting favours and for wanting something, sigh, even my last ex boyfriend sidled up to me for my business contacts and connections to the Dukes and Duchesses of Yore. Is this what friendship means……sigh 2014 is lousy and I have been told by reading the Chinese almanac that the Year of the Goat is also going to be a not too buoyant year. Well, I shall have to see what 2015 brings and do battle with it. I guess one has to be careful in selecting “friends” as lip service is plentiful and wolves in sheep’s clothings plentiful. Sigh….it is official….Nephew has left for Kiwi Land this evening! I will miss this Bieber looking boy. UGH he hates it when I use Bieber to describe him. Can’t blame the kid as Bieber is one bad boy! Nephew was visibly tired arriving Singapore from Hanoi yesterday evening at 5.30pm. Still we went for dinner as Dad was buying a farewell dinner. Probably see them in a year’s time when it is year end university break. With aged parents, time is precious and I am always hoping for Sister & Nephew to spend more time with parents/grand parents. It is a blessing to have both parents around but I know they are not immortals. 27 Course Meal - We Pigged Out! Food at RELC Orange Grove is always consistently served by Ban Heng Restaurant. 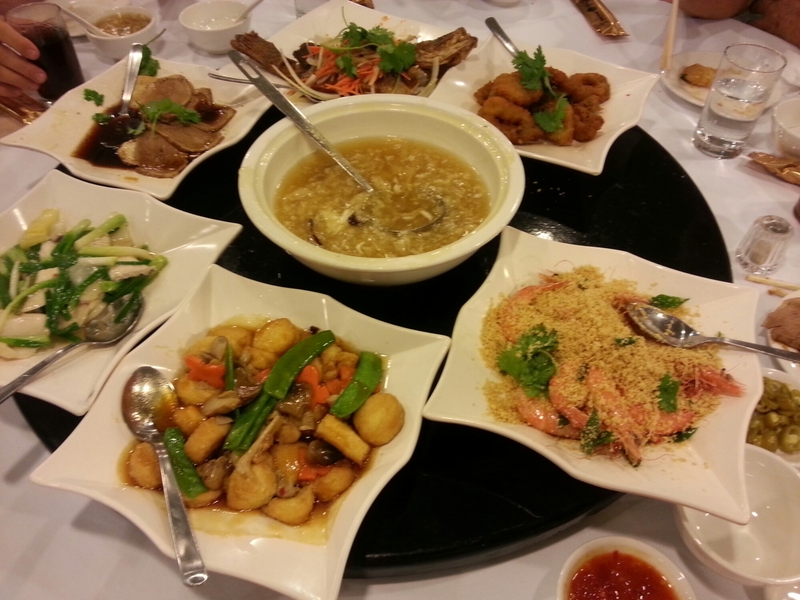 We had loads of dishes starting with their signature Ngoh Hiang, Spring Rolls and Fish Maw Soup. Prawn Salad followed, dou fu fried with veggies, roasted chicken, Thai Style Garoupa Fish, Sliced Fish With Spring Onions & Ginger, Sweet & Sour Pork, Cereal Oats Prawns, Teochew Braised Duck, Fried Rice With Silver Fish, Sweet Sour Fish, Yam Paste With Gingko Nuts, Sea Coconut With Longans, Lemon Grass Jelly with Fruit Cocktail just to name some of these yummy dishes we ate. As you can tell we are a foodie nation and I cannot remember all 27 dishes LOL! Variety is spice of Life! I was happy to sup with them but sad knowing they were leaving. I wish them all a safe flight home and will wait with trepidation for my Sis’ reply to let me know they safely arrived home. I have always dreamed of a mindless job, whereby I need not work too hard but still enjoy a decent salary. I used to eye the job of a cashier at the gas station a block away from where I lived and would dream working the night shift. Customers would be limited as there was only a one way traffic to get to this gas station. Further, it was nice and quiet which meant that I could catch 40 winks and if bored, do crosswords once I finish my stacking of the shelves or what it was required of me. HA! That was my “ideal” job – paid to sleep and paid to do crosswords. As I cased the joint as Americans would say, I told self I must never work the day shift as this station was located near two major schools and I have been there during the day. WOW! The customers that come in to buy snacks, sodas or chips etc are plentiful and loud noisy school children with wads of cash but with nothing to buy from the school canteen given the heed to health promotion board’s need to feed students proper foods at recess time. Deprived of sugary foods, high salt low fibre diets, these kids found this gas station and gleefully would part with their allowances for Coca Cola, 32 Oz Gulps or tortillas, chips, crisps, curry puffs or anything edible that tastes good! Sadly this station closed shop middle of this year. I suspect it was either low volume of gas sales which is much required under the Esso brand for meeting targets OR because of upcoming Mass Rapid Transport services. Whatever the case, there goes my dream of a mindless job. I walked about the heartland mall yesterday and found that yes, shop assistants were much in need. But the pay was negligible and I wondered if I could stand on my feet all day. If I had a perfect spine, I guess I would pounce on it in a jiffy and apply for the job as I wait for a proper job to come by. So far no calls for jobs and I am being positive in telling self, it is is holidays and most people are away and or holding onto current jobs till they receive their year end bonuses. If I was being negative, then my self worth would go down the drain as they say….I am useless and being unable to elicit an interview. S Man was sharing with me that he felt that after 10 months being jobless. He felt he was useless and could not command a job. Having subsisted on his savings, he desperately needed to get back to a job. It did not help that his wife was especially difficult with him, given they had two young children. I am better off in a way – I have no naggy husband, no children and happily only with inanimate fur balls called Garfields and they thankfully do not eat, poo or pee. But what I do have is a sister who would poke me to taking a sales assistant job and making me feel like useless as I am. Such is life. We work or slave our lives to pay for bills as we live. We hold onto to mindful jobs in exchange for horrific unkind bosses or at worst, bosses, who are “dirty” in their dealings too! Minions at a mindful job or “King” of a mindless job – if I had a choice, I would go for a mindless job anytime and be happy to take whatever pocket change as salary and enjoy 40 winks or crosswords during the wee hours of the morning once my basic tasks were done. Now that is a wish…. LOL!